It's time for another review from the guy they called Mister Drake before they called me Mister Drake, by which I mean my dad. This was a big help tonight, because I didn't have anything ready at all, and since I've already spent most of the night hooking up my new computer, I probably wouldn't have had anything, anyway. If you haven’t had a good look at what comes in the new Thunderstone expansion, Heart of Doom, I’d say you’re in for a pleasant surprise. There are some great new concepts in these cards, and more player interaction. 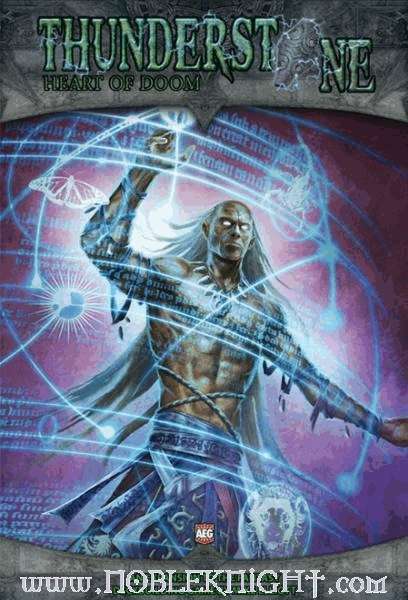 The theme of Thunderstone is strongly reinforced and sweetens the cards we have so far. In fact, this is my favorite expansion to Thunderstone yet. After opening the box I pulled out a packet of cards, and the first card I saw was “Grognard”. Ah, a beautiful introduction to the game, and it elicited a smile. As I opened the packs of cards and read what they do, I was immediately hooked. Some great ideas here, and again some great artwork. Unfortunately, I’ve only played this new expansion once, but after this initial play I have very good impressions. One of the best things about the expansions to Thunderstone is the increasing player interaction they’ve promoted. Heart of Doom is, I believe, the best in this regards so far. For example, the Highland Soldier (not sure if this is a female or male soldier, female I think – kind of scary). If you destroy the level one Hero you can steal a treasure from another player. Not interaction that promotes marital bliss when you play this on your wife, but it’s interaction all the same. And then there’s the Ritual of Cleansing. You play it on a player, and you can play it on yourself if you want, and that player draws 5 cards from the bottom of their deck and destroys 2. It can be a blessing or a curse. I like that twist. And then there’s the touch of brilliance of the Grognard (yes, it’s an old French term for a war veteran, but we all know that today it refers to US). If you have traps in the dungeon and you trigger one, and the Grognard is along, you can choose another player to suffer the effects. Hmmm, it does reflect the attitude of some guys I’ve gamed with. Tis true that the artwork in some of the earlier expansions fell pretty flat (I’m still very unhappy about the replacement to Iron Rations. The original card looked like Lembas, or maybe K-rations, but the newer artwork looks like a full three-course meal, with plates and silverware. Should have changed the name of the card to Picnic Lunch.) Anyway, point I’m trying to make is the artwork in Heart of Doom is especially good. Two of the Heroes, Isri Thrower and Nyth Bowman, are beautiful to behold. Kudos to you, whoever you are who did these cards. About the Isri Thrower, she really does throw stuff – from weapons to any odd item you may have in your hand (so she can even throw a lantern if she has one with her). As always in a collection of this many cards, some of the art doesn’t inspire, but the exceptional far outweighs the bland. Game play isn’t greatly impacted by any new game mechanics – new rules cover all of one page, only two points. But some of the cards utilize the mechanics we’ve learned so far in new and wonderful ways. All-in-all a great expansion. The Short Spear adds Attack +2 when equipped to a Militia. All of a sudden your Militia aren’t taking up as much space in your deck as they used to. And then there’s the Chalice Mace. This is a heavy item, but those scrawny clerics know how to heft these – if a cleric picks one up, it requires three less strength. They also add +1 to your light, so if you put some clerics in your deck you’ll absolutely want to match them with this mace. The Guardian “Heart of Doom”: The worst nightmare of a Guardian yet. This card will stop all players in their tracks and take a while before anyone can take him out (Health of 25! But 15 VPs!!!). Think you’ll sacrifice a turn and send him to the bottom of the deck? You can do so, but the card has the clever caveat, “If this card is not defeated, the player loses.” Holy crap! Like getting punched in the solar plexus! As a final touch for the games so far, this one is classic. How could you not love this guy?!? And if you let him breach, that’s the shootin’ match – the game’s over. Nice touch! Monster Abyssmal Darkspawn: These guys are truly dark – they cause rank 1 to be take on a much higher light penalty. They slowed our game down appreciably as we all started drawing more light sources. I like these guys for how they twist the game. Monster Basilisk/Animal are really wimpy and should be easy to take out. But they all gain Health for heroes, items, weapons, etc. that are revealed. They’re still too weak to slow you down too much, but they add a fascinating quirk to the dungeon. Yep, I like these guys too. Lizardfolk Humanoid: If you like monsters that are hard to take out and slow down the dungeon for a bit, then you’ll love these guys. Spider/Animal: The spiders aren’t that hard to kill (except the Queen), but if they breach someone’s going to die – you can lose several Heroes to these cards. In our game we didn’t have any breach, but their threat was noted. A great addition to the cards. Undead/Spectral: Every time you take on one of these guys, you have to destroy or discard something. And yeah, I like these monsters. The Dopplegangers: Some guys like these, but I for some deeper existential reason I just don’t. They look like some of your friends in the village, but these guys are evil. Kind of a Jekyll and Hyde syndrome I guess. And by the way, what are they trying to get away with in the dungeon anyway? They should be lurking around the street corners in the village. If I met the blacksmith in the deepest pit of the dungeon, what are the odds I’d ask him to sharpen my blade? Maybe they have a place in some dungeons, but I’ve called Homeland Security on these guys in my games. I'm running really low on review copies, which means I'm going to be counting on Noble Knight Games to hook me up with a few I can't get otherwise. And for that kind of thing to keep happening, and for me to keep reviewing the stuff you ask for, they have to know they're appreciated. So if you're going to buy games, I would consider it a personal favor if you would get them from Noble Knight. And it never hurts to drop my name when you do it. Thanks for the review, I pretty much picked up Thunderstone because of your previous reviews and it seems I only have room for one more expansion in the box, so it'll be this one. You rule, man. Thanks for using Noble Knight. Hope you love the game.